No matter what room in the house needs new flooring, you have a wide array of building materials to choose from to replace it. Ceramic tile and hardwood are popular options, but you might consider reclaimed wood as a unique alternative that will add character and a rustic feel to any space. Here are some ways the renovation pros at Tiefenthaler are using this distinctive floor covering in Fairfield County, CT area projects. Install reclaimed wood in your family room for a rustic touch on this casual room in the house. The bonus is that the surface of wood is sound absorbent, so the loud movies and video games won’t echo throughout your home. With an accent rug or two, your floors are also comfortable and family friendly. 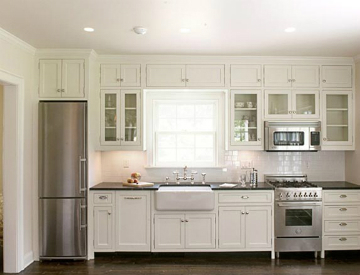 Wood flooring is also an excellent option for your kitchen. It’s easy to clean with regular sweeping and mopping, and long term maintenance is a breeze. Plus, it’s durable, so it can withstand all the wear and tear your family can throw at it. If you spend lots of time in the kitchen with meal preparation, your feet will also thank you for installing reclaimed wood floors. Consider reclaimed wood in your master bedroom if you like a rustic, beachy style. 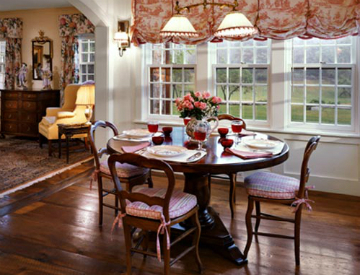 The look is reminiscent of cottage or colonial interior design, with its weathered appeal and softness. Shades of blue and green really pop against dark wood, bringing the feel of the seaside and enhancing the peaceful atmosphere you want in your bedroom. There are many other options for finishing your home’s floors with repurposed wood, including a media room fix up or family room renovation. Please give us a call at Tiefenthaler to hear more about our current projects or to schedule a consultation with one of our home improvement specialists. When you’re in the market for a new home, your budget is one of your most primary considerations. You want to get the best price on a place that offers the features you want. As such, you might think that buying a new speculative home will help you get a great deal on new construction. However, as the professionals at Tiefenthaler can attest, these speculative companies don’t have your best interests in mind and will cut corners wherever possible to increase their profit. Speculative home building companies build according to plans drawn up by architects who have no connection to the homeowner who purchases the property. Typically, these structures are cookie-cutter in nature and have the bare minimum in terms of features, accessories and appliances. This enables them to get a discount on building materials, though the savings aren’t passed on to the buyer. Often times its the things you cannot see that are compromised, such as the type and quantity of insulation, the quality of the interior cabinetry and hardware, very basic or minimal moldings and the quality of the plumbing fixtures or home appliances. In contrast, custom home builders aren’t in the business of making a profit at the expense of inferior quality. Builders like Tiefenthaler consult with and listen to the needs of new home buyers and the architect they chose to design THEIR custom home with all of the features and benefits tailored to their taste and budget. Every element of the home gets the blessing of the homeowner, from the foundation to the roof. The point to be taken away is that speculative or housing developing homes are not always the best option when it comes to investing in a new construction home. Custom home builders like Tiefenthaler work closely with you and your architect to design and construct your dream home, using your input at every stage along the way to ensure the end result is exactly what you want. Please contact our office to hear more about our new home construction or schedule an appointment to view one of our projects. If you can’t remember the last time you enjoyed a fancy meal in your formal dining room, it’s time to consider making some changes to how you use the space in your household. More homeowners are finding new and innovative ways to utilize this space instead of just sitting at the table for once a year dinners. Here are some home remodeling projects and trends the construction experts at Tiefenthaler have seen around the New England region. Opt for a media room if you like to entertain. Family rooms are great for daily TV time, but if you have friends and family over often to watch sports or movies, a media room is a great conversion of your dining room. Theater style seating ensures that everyone’s comfortable, and a couple of pillows on the floor work well when you have a full house. Install built-in cabinets to house your media equipment and for storing games and DVDs. A craft room is a do-it-yourselfers dream. Arts and crafts supplies take up a large amount of space, so turning your dining room into a crafting area is a wise use of the space. A handy shelving and drawer unit keeps everything organized, while a large table surface is great for projects. Working from home requires a dedicated office space. Telecommuting is becoming more popular, and many homeowners are converting their dining room into a handy home office. Storage is a necessity, so include plenty of drawers and shelves in your plans. You’ll also need a work station and comfortable office chair. Would you like to hear more about the home remodeling projects we’re currently working on at Tiefenthaler? Please give us a call to speak with an agent about our areas of expertise, including new home construction, interior renovations, and custom millwork. When you live in a historic home, you’re fortunate to enjoy the quality craftsmanship and expertise of the builders who created it. However, many older structures can benefit from preservation efforts to bring modern conveniences while still staying true to the original charm. If you’re considering historic home renovations, the specialists at Tiefenthaler can offer some advice on the mistakes you want to avoid. 1. Adding roofing that’s inconsistent with your home’s aesthetic appeal can ruin its grandeur, negatively affecting it’s historical nature. While a new roof might be recommended to increase energy efficiency, modern materials and building techniques don’t always work well with the original architect’s intent. Talk with your contractor about other ways to improve your roof without destroying your home’s charm. 2. The landscaping surrounding your historic home is just as much a part of its overall appearance as the structure itself. Make sure your yard features and accessories coordinate with the style of your home to enhance its appeal rather than compete with it. 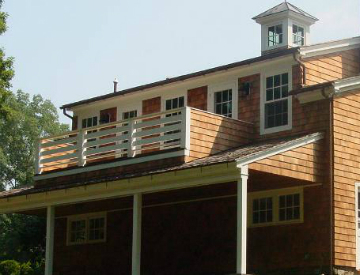 The classic lines of your home require traditional styles for your deck or patio as well. 3. The architect and construction experts who built your home had a certain image in mind for the indoors appointments, so it’s important that your interior design be consistent with their vision. Beamed ceilings and high quality wood trim are out of place against contemporary furnishings and artwork. Also, the charm of historic homes is best highlighted with paint colors in earth tones, such as terra cotta, soft yellows, sage green and beige. If you’d like to hear more about our historic home renovations or view one of our recently completed projects, please contact the Tiefenthaler office. 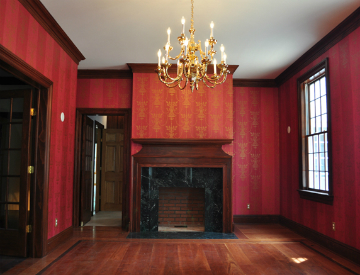 We can answer your questions and provide additional details on our historic preservations, including custom millwork and outbuilding construction. When you’re planning on installing a pool, it’s great to get ideas from as many sources as possible. Friends and family can offer advice, but Tiefenthaler exterior design specialists also suggest you find inspiration by peeking into the homes of the rich and famous. Here are some amazing celebrity pools with features you should consider for your own outdoor space. 1. Mark Walhberg’s patio in Beverly Hills, CA puts the focus on natural elements, including the greenery and large boulders that surround the pool. Several cabanas and a pool house with a Spanish-tile roof complete the Southwestern-style look. 2. The view is the focal point of the outdoor space at Bruce Willis’ Hailey, ID home. Enormous windows overlook the pool, which is encircled by slate tile and natural stone. The balcony is heated to provide warmth against the evening chill. 3. The infinity pool at Burt Reynolds’ Beverly Hills, CA home looks out at the beautiful Southern California landscape. The minimalist approach is both clean and modern, with nothing to interfere with the amazing view. 4. Larry the Cable Guy takes a tropical approach to his outdoor space in Sanford, FL. Lush palm trees and ferns surround the lagoon-style pool. The outdoor kitchen and fire feature make this retreat enjoyable both day and night. 5. A geometric-shaped pool is the focal point at Arnold Schwarzenegger’s palatial estate. Pergolas constructed from heavy wooden beams provide contrast to the modern pool and multi-tiered patios. A waterfall adds to the peaceful feel of the space. These celebrity pools offer just a few ideas as you’re planning your own dream space. The construction professionals at Tiefenthaler have extensive experience in designing and building outdoor areas, including outbuildings, pool houses and patios. Please give us a call to hear more about our recent projects.